A church has stood on this site since at least 1180. The stone structure seen here probably replaces an earlier wooden church. It was originally dedicated to St Gwerydd, but sometime in the 12th century the dedication was changed to St Donat (St Dunwydd as written in Welsh). He was a ninth-century saint born in Ireland who later became Bishop of Florence. He was a popular figure amongst maritime communities on the European mainland as a patron saint of sailors. 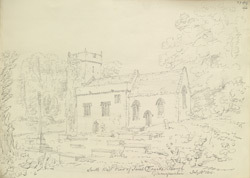 The manorial Stradling family of St Donat's, who also owned land in England's western counties, ventured often over the Bristol Channel, hence their desire to dedicate their church appropriately.